Hello from Beautiful Lake Tahoe! The owners created the "Bears Den" at Lake Tahoe with family's looking to explore and play in Tahoe in mind. A complete makeover allowed the owners to add a total "Tahoe Package" to this home. With vaulted pine ceilings, cozy river rock wood burning fireplace, surround sound Satellite TV with DVD/VCR, a very private deck with a hot tub, a pool table/air hockey game, and all log and pine furniture throughout this is exactly the Tahoe get-a-way you have been dreaming of! 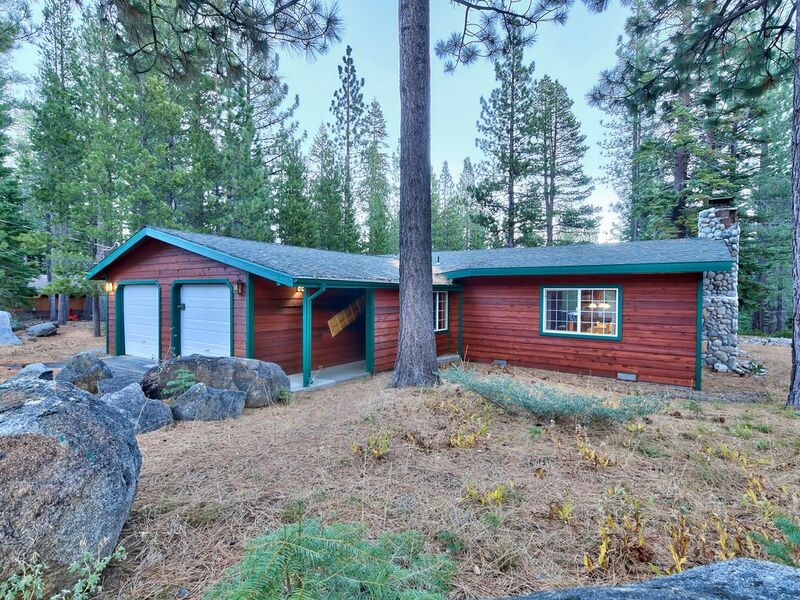 Located in an upscale and secluded area of South Lake Tahoe this home is minutes to Sierra @Tahoe, Heavenly and Kirkwood. Fallen Leaf Lake and Echo Lake are just minutes away as well and all the glitter of the heart of South Shore's famous casinos are 13 minutes away! Take a stroll down the street and hike into the Lake Tahoe back-country and Desolation Wilderness. If you love to ski, snowshoe, cross country ski, sled, mountain bike, hike or just goof off this is your next vacation destination. By the way, we provide all linens including flannel sheets, cozy down comforters. It truly is all right here at "The Bears Den". Maximum # of Vehicles: 3 vehicles must be parked in the driveway, the garage is not accessible. Real fireplace, local phone, 2nd TV in queen bedroom Full Kitchen, beach chairs, Pets Allowed w/advanced notice. 6 foot pool table that flips over to an air hockey game. Roomy and comfortable. A problem with one of the showers, but it was repaired immediately. Great response time from the management. Pretty location in a quiet neighborhood. A nice remodel especially if you want to get a little way away from the town and enjoy the backcountry. We enjoyed going to the end of the street and being able to take our husky for long walks, and my husband even took him out for cross country skiing. I don&#x2019;t know who loved it more, us, or our husky! It was also an easy enough drive to Heavenly, Stateline, and Sierra-at-Tahoe. Pinnacle was quick to respond to a question about the hot tub. No problems overall. Bath rooms could use a little more updating, but served our purposes well. Took multiple tries to get the lock box locked again, but finally got it. Overall, a great stay, and would return in the future to this home. This was our first time doing a vacation rental and we enjoyed it so much! Thank you for opening up your beautiful home to us. We loved it and can't wait to come back. It had everything we needed! Thank you! Come back in the summer, it is a great place to stay and use as your home base for hiking and exploring all around Tahoe. Thank you! You and your family (and dogs) are welcome back anytime! We enjoyed the cabin and time with our son and family. There were some issues with doors not locking, lights not working and locks on window falling off, which we fixed. The couch was in terrible shape and the leather was disintegrating all over us and the floor. Could have used some better cooking utensils, especially for cooking on the stove. The oven door glass door was broken and was hazardous. This property could use a major upgrade for the price. Working on new couches for the living room. Always looking for recommendations for the kitchen as we know visitors like to cook. Minutes from gorgeous Lake Tahoe, mountain lakes and streams. Great base for exploring, hiking, mountain biking. An easy drive to the beach, casinos, restaurants, and all Tahoe activities. CSA Travel insurance is available for an additional fee. High Summer (Jun 15-Sep 06) .. Rates range from $150-$350.... $1400/week. Off Season . (Late Marc-Mid June/Sept7-Dec.15)_$125-$225/night (Call For Specials). Call For Mid-week winter specials, slopes are quieter and the hot tub is hot!